These 9 pork chop marinades are easy to mix up and add so much flavour to your pork chops. Marinate and then grill, pan fry, or bake, or freeze for later! 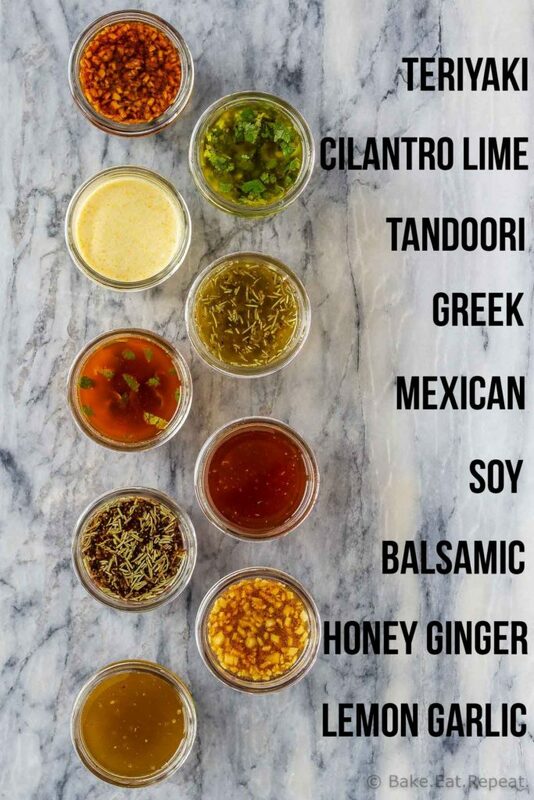 My new favourite way of making dinner time easy and hassle free, while still having lots of variety, are these nine pork chop marinades. 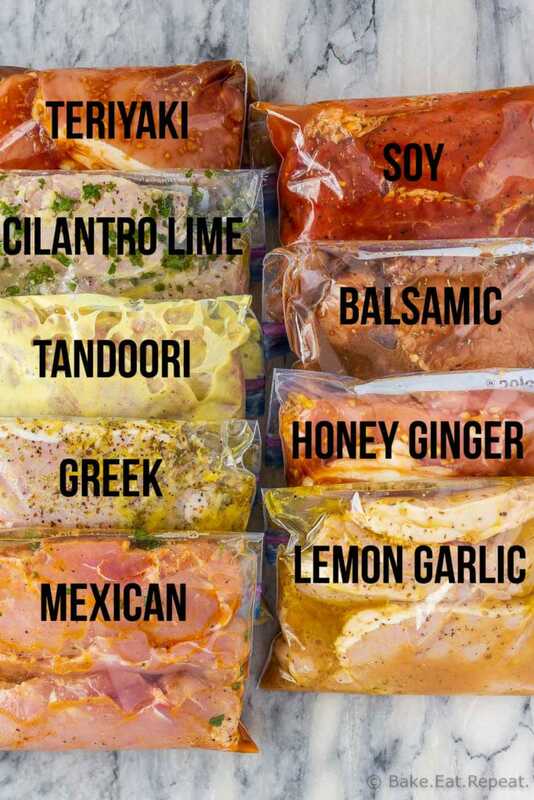 Marinate the pork chops when you buy them with these easy freezer pork chop marinades, and you will always have a quick and easy dinner option in the freezer. Whether you prefer your pork chops boneless or bone-in, you can buy them in large packages (or as a whole pork loin), portion them into smaller, meal sized ziplock bags, and add a tasty pork chop marinade to it. Then you can either marinate your pork chops and grill, bake or pan fry them a few hours later, or freeze them immediately and let them marinate as they thaw when you’re ready to use them. 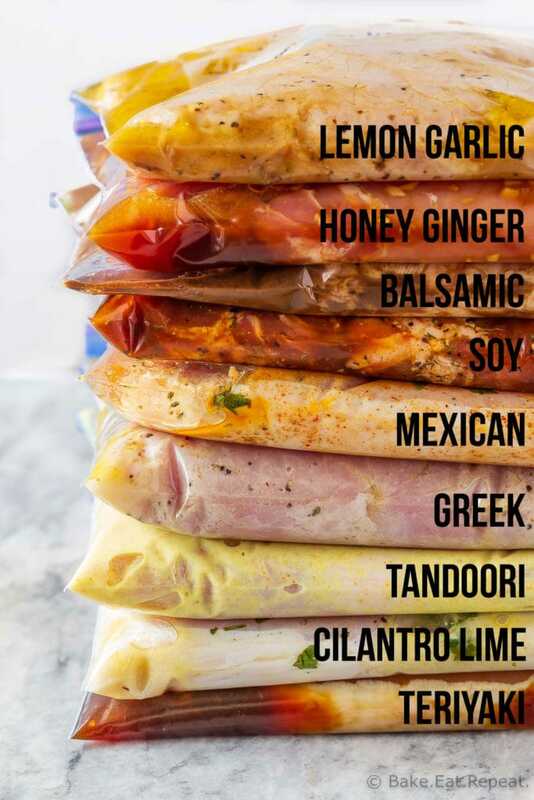 Going to the freezer and having a number of these pork chop marinades ready to go for dinner, so you don’t have to think about what to prepare, is the best way to make your weeknight meal prep easy. I have nine simple pork chop marinades for you, and they’re all delicious. So easy to make, they each only take minutes to mix up and add so much flavour to your meat. Marinate the pork chops for at least 30 minutes, and I find 2-4 hours gives the best flavour. You can technically marinate pork chops for up to two days in the fridge, but I don’t find the flavour changes much as you increase the marinating time from 4 hours. 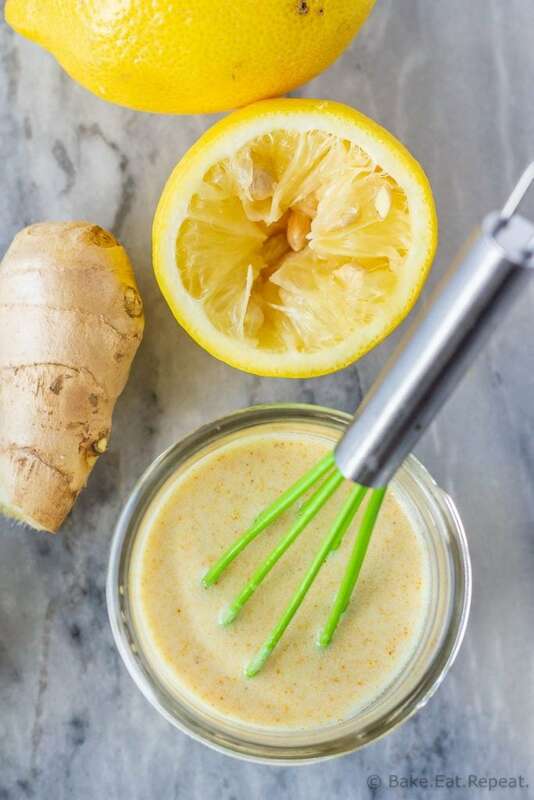 You also need to be careful when there is an acidic component like lemon or lime juice in the marinade, as it starts to break down the meat after a certain point. My recommendation is to cook it the same day you’re marinating, or to freeze it and let it marinate as it defrosts overnight in the fridge, or for a couple hours in cold water. I have found that any marinade that is good on chicken, is good on pork chops as well. So if you have a favourite chicken marinade, it’s likely good on pork chops as well. You can find 7 chicken marinades here – there is some overlap with the pork chop marinades, but some are different. I like to add a marinade to the pork chops as soon as I bring them home from the grocery store, and then freeze them. This way the meal is already prepped for me, and the night I cook them doesn’t require much thought. They marinate while they defrost, and I don’t have to think about what I’m going to do with the pork chops for dinner. You can also just marinate the pork chops for 2-4 hours in the fridge, and cook them the same day if you like. If I’m cooking them the same day I like to marinate them in a shallow baking dish, turning the meat to coat it in the marinade before refrigerating it. There are several options for cooking pork chops. You can grill them for 4-8 minutes per side, depending on how thick they are. For 3/4 inch thick pork chops I grill at about 400F for 4 minutes per side. You can also pan fry them over medium heat for 4-8 minutes per side (add 2-3 teaspoons of olive oil or butter to the pan while it’s heating). Or you can bake them at 400 degrees F for 20-30 minutes, turning once. The exact cook time will really depend on the thickness of your pork chops, so use a meat thermometer to judge when they’re done. Pork chops are cooked when their internal temperature is 145 degrees F. After you remove them from the heat, let them rest for 5 minutes under some foil before serving them. The most important thing is to not over cook your pork chops, or they will be dry. If you’re not sure how to tell if they’re done, use a meat thermometer and trust it! Resist the urge to slice into them to check. They continue to cook after you remove them from the heat. If you cook them until they look totally done inside, they will be overdone by the time you sit down to eat. I almost always use boneless pork chops. I like to buy the huge pork loin from Costco when they’re on sale and then slice it into a whole bunch of pork chops, marinate them, and freeze them for later. Typically I slice them about 3/4 inches thick. You can definitely use bone-in pork chops instead, but keep in mind the cook time will likely be a few minutes longer. 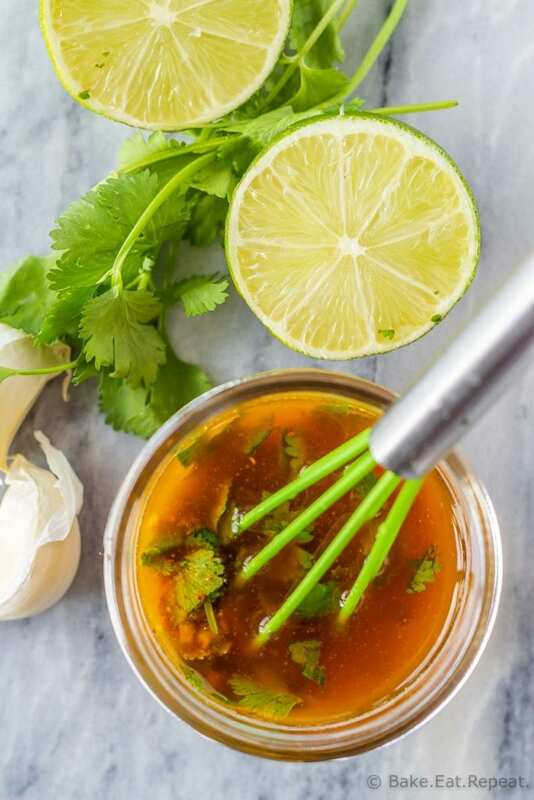 These pork chop marinades can be easily adapted for different amounts of meat, depending on how many people you are cooking for. This teriyaki pork chop marinade is amazing. 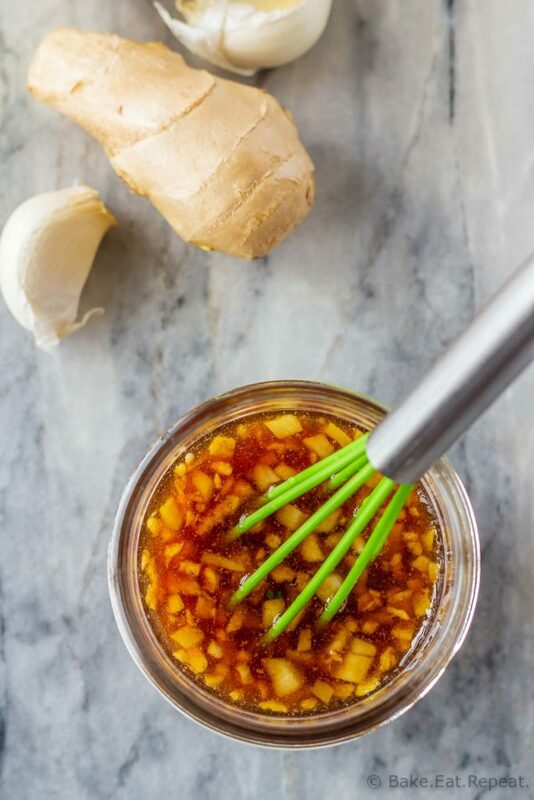 Make sure to use fresh ginger and garlic for the best flavour. I like to use a garlic press to mince my garlic. The ginger just needs to be grated finely or minced with a knife. Fresh ginger can be cut into one inch pieces and stored in a ziplock bag in the freezer so you always have it on hand. Mince or grate it straight out of the freezer into your recipe, you don’t even need to peel it if you don’t want to. Find the full recipe for the Teriyaki Pork Chop Marinade here. 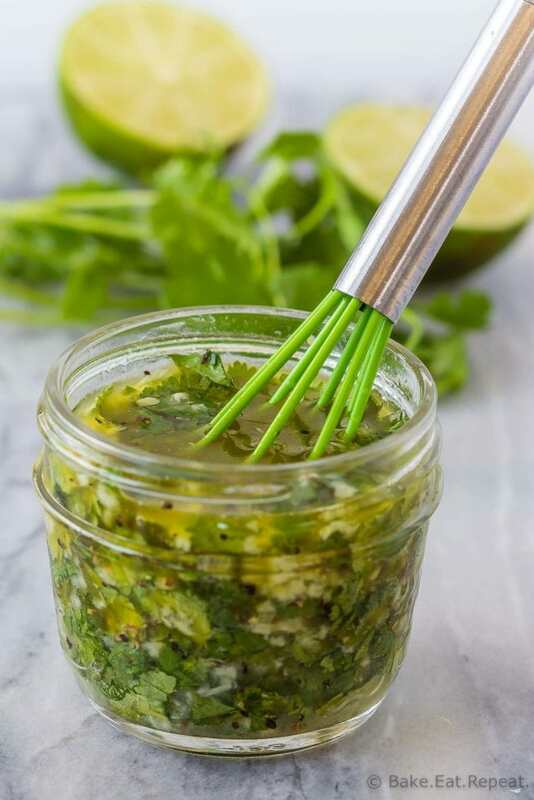 This cilantro lime pork chop marinade is one of my favourites. It’s a super simple recipe that gives your pork chops so much flavour. A garlic press is useful for mincing the garlic. I love this juicer for juicing the lime. This Tandoori pork chop marinade is likely not all that authentic, I really have no idea. I can’t remember where I found it, and I’ve changed it a bit. I will say that it’s absolutely delicious. The yogurt in the marinade tenderizes the pork chops and the flavour is fantastic. The cayenne doesn’t make the pork chops spicy, it just adds flavour. There’s not enough to make it spicy, if you’re concerned about that. I love this juicer for juicing the lemons. Find the full recipe for the Tandoori Pork Chop Marinade here. This Greek pork chop marinade is so full of lemon flavour and it goes perfectly with Greek salad, which happens to be a family favourite around here. We make these Greek pork chops a lot, they’re so tasty! Find the full recipe for the Greek Pork Chop Marinade here. Mexican flavours are a favourite at my house, so this Mexican pork chop marinade is always a hit. If you’re not a cilantro fan, you can easily omit the cilantro from this one, and still have delicious Mexican pork chops. I’ve made it that way a number of times, although I do prefer it with the cilantro (but I’m a cilantro lover and I know not everyone is)! Find the full recipe for the Mexican Pork Chop Marinade here. This soy pork chop marinade might be my favourite of all the nine pork chop marinades here. Although it’s tough to pick a favourite, this one is just so simple. Three ingredients that I always have on hand, and approximately 30 seconds to mix it up. It makes for the most delicious, tender, grilled pork chops ever. We love this one! Find the full recipe for the Soy Pork Chop Marinade here. I absolutely love this balsamic pork chop marinade. It has a few more ingredients then some of the others, but there’s so much flavour in the pork chops. Plus, I just love anything balsamic. If you love balsamic flavour too, you will love this balsamic pork chop marinade. A garlic press speeds up the process of mincing the garlic. Find the full recipe for the Balsamic Pork Chop Marinade here. This honey ginger pork chop marinade is pretty mild in flavour, and everyone likes it. 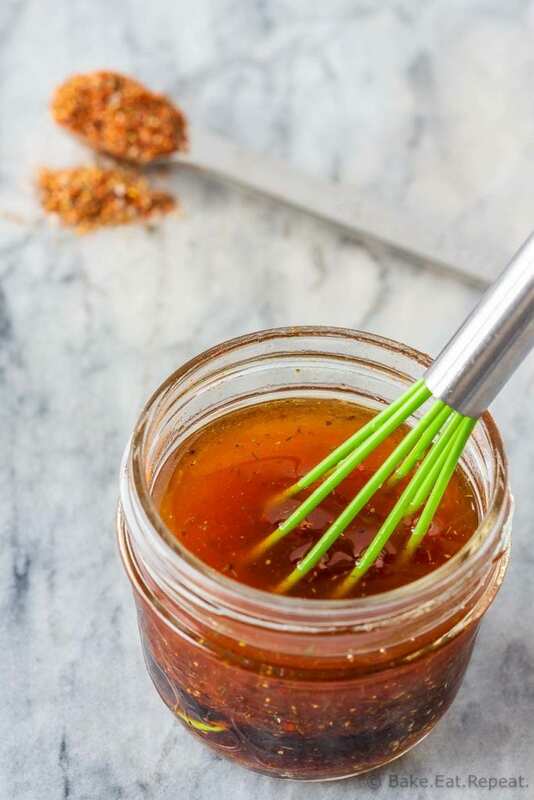 It adds flavour to your pork chops without being super strong.It’s a great pork chop marinade to use if some people in the house want to eat their pork chops with applesauce, and some like them plain. This pork chop marinade works with either option. A garlic press is useful for mincing the garlic. 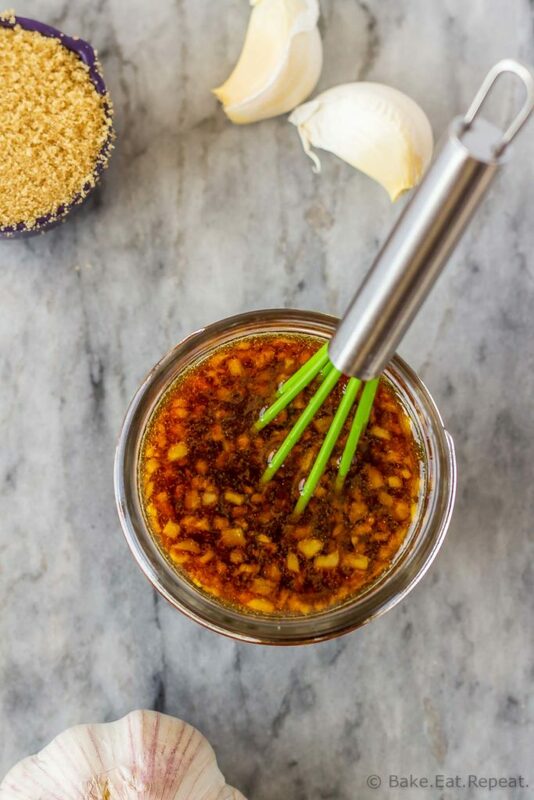 Find the full recipe for the Honey Ginger Pork Chop Marinade here. 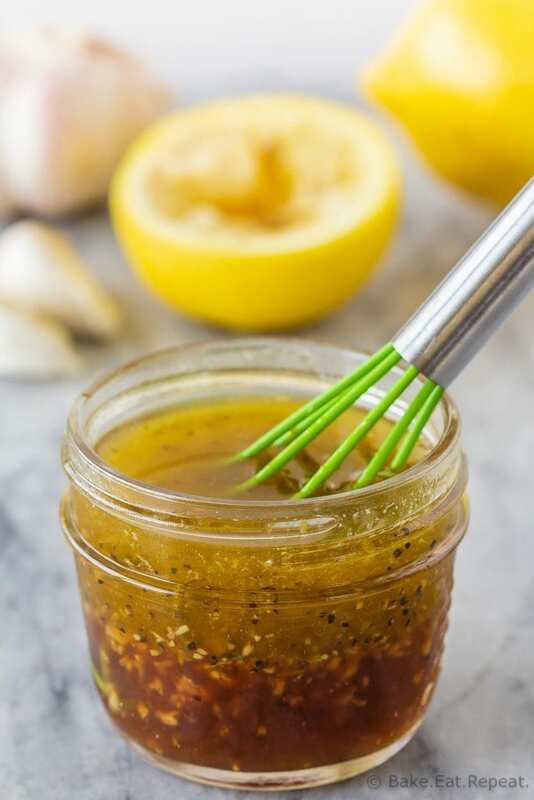 This lemon garlic pork chop marinade is quick and easy to make and tastes fantastic. 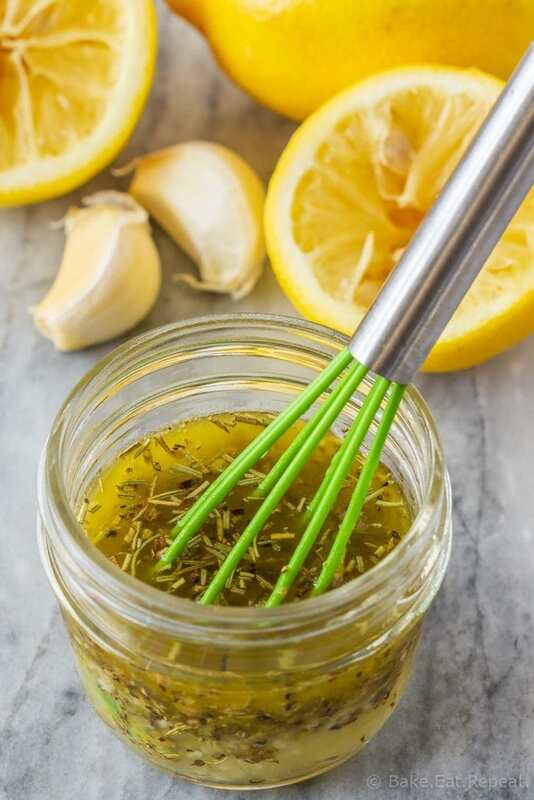 Make sure to use fresh lemons and garlic for the best flavour. You can either mince your garlic or press it through a garlic press. This juicer is fantastic for juicing the lemons. 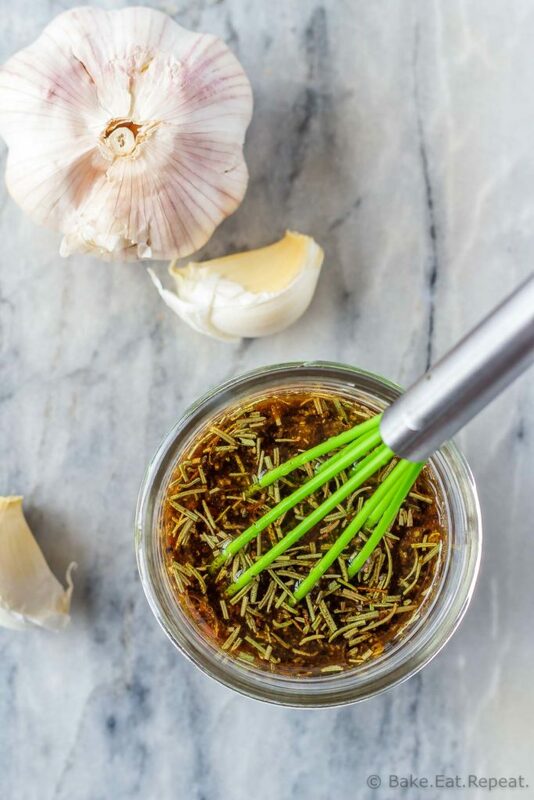 Find the full recipe for the Lemon Garlic Pork Chop Marinade here. So smart! You've definitely shown how easy it is to whip up a marinade, how easy it is to custom design the flavors. Love it. Chef's Illustrated had a study on how much marinades actually add flavor, and you're right. They proved that more time doesn't equal more flavor. But I do know that is there's a serious acid in a marinade, you can't marinate pork even overnight. It will become mush. Yup, acid in the marinade definitely ruins the texture of the meat if it's left in it for too long. I mentioned that in the post.